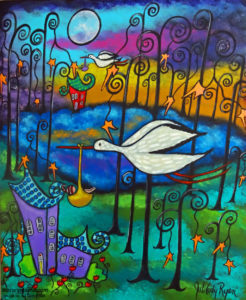 Artist Juli Cady Ryan delights in the whimsical and writes this about "Gift at Sunset": "Though I never used the stork story for childbirth with my children, I always thought it was such a fun, whimsical story that deserved to be painted. . . . when we see this image, we know exactly what it means." Juli's work makes me smile, but I realize the desire for motherhood isn't always this light-hearted. For some, it's filled with sadness and loss. For some, there's quiet acknowledgement and acceptance. For others, there is no desire. If you're familiar with our submission guidelines, you know that we pride ourselves on featuring top-notch writing about the complexities and many faces of motherhood. You may not realize, however, that our editors keep their eyes open, year-round, for writers, books, and creative writing that speak specifically to desire—both the desire to have and the desire not to have children. This issue explores issues of primary and secondary infertility; the effects on the human soul of reproductive technologies; concerns about having more children or not having any at all; the relationship of caregivers to the mothering role and their desires for mothering; and more. I hope you'll find yourself in the pages of this issue and in the archives of our past Octobers. Welcome to this year's selections of Desiring Motherhood. Juli Cady Ryan is a self-taught artist and who has been selling her art worldwide for 12 years. What started a as a hobby, soon became a vehicle for her to share her experiences with her family’s mental illness. Her art has now been in galleries, from the Smart Gallery in Springfield Missouri, to the Fuller Lodge Art Center Solo Exhibition in their Portal Gallery. She has also written a bedtime story for children, “The Sleep Fairy and the Magic Sheep,” a fun story to help the little ones fall asleep. Recently she has self-published a book of paintings, Wounds of Wisdom, that along with her poetry and Juli’s own words, show the pain and hope of dealing with mental illness in her family.